Do you enjoy reading the health tips that world renowned nutritarian Dr. Joel Fuhrman shares with the Yummy Plants community? Imagine a whole week of classes and seminars with Dr. Joel Fuhrman’s Health Getaway at the Ritz Carlton on Amelia Island, FL from August 19 – 25! There’s discounted registration until February 29, 2012. 2012 marks Dr. Fuhrman’s 6th annual health getaway featuring lectures, gourmet nutritarian food, exercise classes, and cooking demonstrations led by Dr. Fuhrman. The getaway is designed to teach participants how to live a healthy lifestyle and provide tools to continue living a healthy, nutritarian lifestyle upon re-entry at home. Dr. Fuhrman’s lecture series will be broken down into ten sessions, with topics including food addiction, heart disease and diabetes, menu planning, and more. Cooking demos will be led by Dr. Fuhrman with a guest appearance by Executive Chef Chad Sarno of RawChef.com. The Health Getaway is a family friendly event and babysitting services are available (for children under 5). The Kids’ Corner will keep your young ones occupied in a healthy and educational environment. There is a daily Toddler Craft Time, Kids Story Time, and even private bedtime stories from an exotic cast of characters: the resident Pirate, princess, and mascot, a three-year-old macaw. The Ritz Kids Camp also provides opportunities for children 5-12 to experience hands-on learning about the surrounding environment. Trip activities include river cruises, wildlife tours, a luau party and more! 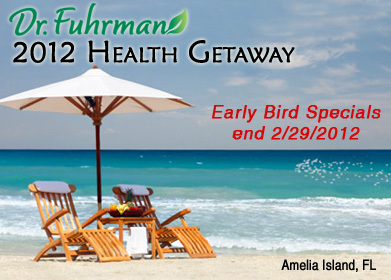 Dr. Fuhrman’s Health Getaway presents an opportunity to take inventory of your health, learn effective new techniques for healthy eating, and meet like-minded people. What a fabulous getaway – hope you can make it!